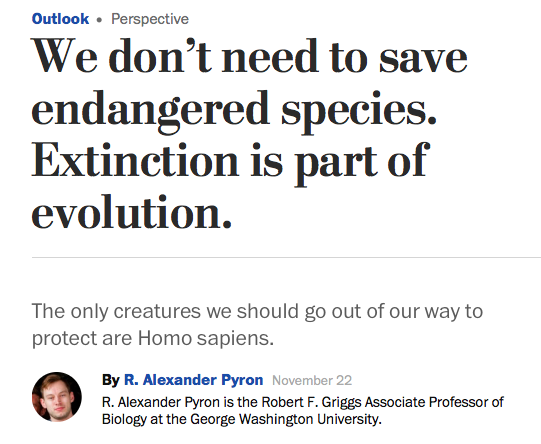 There was a big kerfuffle last week over a Washington Post editorial by a young scientist who seemed to be arguing that extinction is no big deal. The essay inflamed the conservation biology community, producing nearly 4,000 comments in just a couple days. But before attacking the author, everyone should ask who is in charge of editing editorials at WaPo that they would publish such an overly long rambling mess? Using the basic narrative analysis technique I’ve developed, let’s take a look at how it was so poorly communicated that the author felt the need to post on his personal website an equally lengthy explanation of what he meant to say, which really only muddled it further. Whenever you have to issue a second, “What I meant to say,” statement, it means you didn’t communicate well. WHO’S IN CHARGE OF EDITING EDITORIALS AT THE WASHINGTON POST? This is the kind of stuff that makes people hate the mainstream media. It’s generally assumed that you need to have a really, really important point to justify an editorial, and that it needs to be stated clearly and CONCISELY. But then they go and print a train wreck like this? Suffice it to say there was a firestorm of outrage over this “shootin’ from the hip” editorial. And then the author felt so misunderstood he posted his own “clarification” on his website. This is what you get with poor narrative structure. Below you can see I’ve applied my Narrative Analysis technique to look at the overall structure of the essay. This helps you see what a logical mess it is. Narrative Analysis involves identifying each sentence or section according to the three fundamental forces of narrative: Agreement (BLUE), Contradiction (RED), Consequence (GREEN). Great speeches and arguments do a good job of grouping these elements together and sticking to a single, clear over-arching problem to be addressed. Martin Luther King, Jr.’s is about “we were made a promise” (agreement), a century later it hasn’t been fulfilled (contradiction), so we’re gathered here today to continue the effort (consequence). You see this pattern repeated twice at the start of his speech, then in longer form for the rest of the speech. So let me restate this guy’s argument in more conversational style. If he were at a cocktail party, here’s roughly what he would be saying in one paragraph. In our Story Circles Narrative Training program we would call this classic DHY format, which stands for “Despite, However, Yet.” That means you’ve got multiple narrative threads at work in a manner so confusing that we’re on a wild goose chase going after one point after another. So the author was young and inexperienced, as evidenced by his second effort to clarify what he said. But the more important question to ask is who in the world approved this editorial mess? My good man, 1,900 words is not “brief” when it comes to editorials. I published an LA Times OpEd in 2002 on shifting baselines syndrome that was reprinted in three textbooks that was just over 1,000 words and probably could have stood to have been a little less. You, sir, were given an encyclopedia’s-worth of space to make your argument. I want to thank my good friend Gary Bucciarelli of UCLA for bringing this whole brouhaha to my attention. It’s an excellent example of why narrative structure is so important. Had this fellow run through our Story Circles Narrative Training program he would have known to start with the Dobzhansky and ABT templates in crafting his over-arching argument. He would have shaped it around the singular problem-solution narrative spine, and he would have brought it full circle at the end, instead of ending with … a question? All of that would have obviated the need for his secondary “What I meant to say” essay. Here’s the overall breakdown. You can see just at a glance what a mess it was. Which again leads back to the editor, assuming there even was one. The text is color coded according to the three forces of narrative: Agreement (BLUE), Contradiction (RED), Consequence (GREEN). Near midnight, during an expedition to southwestern Ecuador in December 2013, I spotted a small green frog asleep on a leaf, near a stream by the side of the road. It was Atelopus balios , the Rio Pescado stubfoot toad. Although a lone male had been spotted in 2011, no populations had been found since 1995, and it was thought to be extinct. But here it was, raised from the dead like Lazarus. My colleagues and I found several more that night, males and females, and shipped them to an amphibian ark in Quito, where they are now breeding safely in captivity.But they will go extinct one day, and the world will be none the poorer for it. Eventually, they will be replaced by a dozen or a hundred new species that evolve later. But the impulse to conserve for conservation’s sake has taken on an unthinking, unsupported, unnecessary urgency.Extinction is the engine of evolution, the mechanism by which natural selection prunes the poorly adapted and allows the hardiest to flourish. Species constantly go extinct, and every species that is alive today will one day follow suit. There is no such thing as an “endangered species,” except for all species. The only reason we should conserve biodiversity is for ourselves, to create a stable future for human beings. Yes, we have altered the environment and, in doing so, hurt other species. This seems artificial because we, unlike other life forms, use sentience and agriculture and industry.But we are a part of the biosphere just like every other creature, and our actions are just as volitional, their consequences just as natural. Conserving a species we have helped to kill off, but on which we are not directly dependent, serves to discharge our own guilt, but little else. Climate scientists worry about how we’ve altered our planet, and they have good reasons for apprehension: Will we be able to feed ourselves? Will our water supplies dry up? Will our homes wash away? But unlike those concerns, extinction does not carry moral significance, even when we have caused it.And unless we somehow destroy every living cell on Earth, the sixth extinction will be followed by a recovery, and later a seventh extinction, and so on.Yet we are obsessed with reviving the status quo ante.The Paris Accords aim to hold the temperature to under two degrees Celsius above preindustrial levels,even though the temperature has been at least eight degrees Celsius warmer within the past 65 million years. Twenty-one thousand years ago, Boston was under an ice sheet a kilometer thick. We are near all-time lows for temperature and sea level ;whatever effort we make to maintain the current climate will eventually be overrun by the inexorable forces of space and geology. Our concern, in other words, should not be protecting the animal kingdom, which will be just fine. Within a few million years of the asteroid that killed the dinosaurs, the post-apocalyptic void had been filled by an explosion of diversity — modern mammals, birds and amphibians of all shapes and sizes. This is how evolution proceeds: through extinction. The inevitability of death is the only constant in life, and 99.9 percent of all species that have ever lived, as many as 50 billion, have already gone extinct. In 50 million years, Europe will collide with Africa and form a new supercontinent, destroying species (think of birds, fish and anything vulnerable to invasive life forms from another landmass) by irrevocably altering their habitats. Extinctions of individual species, entire lineages and even complete ecosystems are common occurrences in the history of life. The world is no better or worse for the absence of saber-toothed tigers and dodo birds and our Neanderthal cousins, who died off as Homo sapiens evolved. (According to some studies, it’s not even clear that biodiversity is suffering. The authors of another recent National Academy of Sciences paper point out that species richness has shown no net decline among plants over 100 years across 16,000 sites examined around the world. )Conserving biodiversity should not be an end in itself;diversity can even be hazardous to human health. Infectious diseases are most prevalent and virulent in the most diverse tropical areas. Nobody donates to campaigns to save HIV, Ebola, malaria, dengue and yellow fever, but these are key components of microbial biodiversity, as unique as pandas, elephants and orangutans, all of which are ostensibly endangered thanks to human interference. Humans should feel less shame about molding their environment to suit their survival needs. When beavers make a dam, they cause the local extinction of numerous riverine species that cannot survive in the new lake. But that new lake supports a set of species that is just as diverse. Studies have shown that when humans introduce invasive plant species, native diversity sometimes suffers, but productivity — the cycling of nutrients through the ecosystem — frequently increases. Invasives can bring other benefits, too: Plants such as the Phragmites reed have been shown to perform better at reducing coastal erosion and storing carbon than native vegetation in some areas, like the Chesapeake. And if biodiversity is the goal of extinction fearmongers, how do they regard South Florida, where about 140 new reptile species accidentally introduced by the wildlife trade are now breeding successfully? No extinctions of native species have been recorded, and, at least anecdotally, most natives are still thriving. The ones that are endangered, such as gopher tortoises and indigo snakes , are threatened mostly by habitat destruction. Even if all the native reptiles in the Everglades, about 50, went extinct, the region would still be gaining 90 new species — a biodiversity bounty. If they can adapt and flourish there, then evolution is promoting their success. If they outcompete the natives, extinction is doing its job.There is no return to a pre-human Eden; the goals of species conservation have to be aligned with the acceptance that large numbers of animals will go extinct. Thirty to 40 percent of species may be threatened with extinction in the near future, and their loss may be inevitable. But both the planet and humanity can probably survive or even thrive in a world with fewer species. We don’t depend on polar bears for our survival, and even if their eradication has a domino effect that eventually affects us, we will find a way to adapt. The species that we rely on for food and shelter are a tiny proportion of total biodiversity, and most humans live in — and rely on — areas of only moderate biodiversity, not the Amazon or the Congo Basin. Developed human societies can exist and function in harmony with diverse natural communities, even if those communities are less diverse than they were before humanity. For instance, there is almost no original forest in the eastern United States. Nearly every square inch was clear-cut for timber by the turn of the 20th century. The verdant wilderness we see now in the Catskills, Shenandoah and the Great Smoky Mountains has all grown back in the past 100 years or so, with very few extinctions or permanent losses of biodiversity (14 total east of the Mississippi River, counting species recorded in history that are now apparently extinct), even as the population of our country has quadrupled. Japan is one of the most densely populated and densely forested nations in the world. A model like that can serve a large portion of the planet, while letting humanity grow and shape its own future. If climate change and extinction present problems, the problems stem from the drastic effects they will have on us. A billion climate refugees, widespread famines, collapsed global industries, and the pain and suffering of our kin demand attention to ecology and imbue conservation with a moral imperative. A global temperature increase of two degrees Celsius will supposedly raise seas by 0.2 to 0.4 meters, with no effect on vast segments of the continents and most terrestrial biodiversity. But this is enough to flood most coastal cities, and that matters. We should do this to create a stable, equitable future for the coming billions of people, not for the vanishing northern river shark. Conservation is needed for ourselves and only ourselves. All those future people deserve a happy, safe life on an ecologically robust planet, regardless of the state of the natural world compared with its pre-human condition. We cannot thrive without crops or pollinators, or along coastlines as sea levels rise and as storms and flooding intensify. Yet that robust planet will still erase huge swaths of animal and plant life. Even if we live as sustainably as we can, many creatures will die off, and alien species will disrupt formerly “pristine” native ecosystems. The sixth extinction is ongoing and inevitable — and Earth’s long-term recovery is guaranteed by history (though the process will be slow). Invasion and extinction are the regenerative and rejuvenating mechanisms of evolution, the engines of biodiversity.If this means fewer dazzling species, fewer unspoiled forests, less untamed wilderness, so be it. They will return in time. The Tree of Life will continue branching, even if we prune it back.The question is: How will we live in the meantime? One last comment here, which is my critique of the article based just on the content of what he said. The biggest thing he fails to address is one key word: time. That’s the wrench in the works of all this stuff. The current wave of extinctions is happening at an unprecedentedly rapid rate. That’s the real problem. If species slowly go extinct over the course of millions of years or even hundreds of thousands of years or even thousands of years, ecosystems can presumably re-shuffle themselves. But this extinction is happening over hundreds of years. I found a rebuttal blogpost that had a comment to this very point. It said, “Post-extinction recovery of biodiversity takes millions, if not 10’s of millions of years.” That’s the problem.